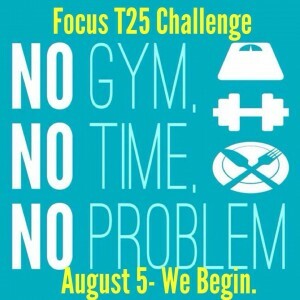 Focus T25 Challenge: August 5! Let’s face it, for some of us getting to the gym is difficult if just not in the cards right now. There’s a shortage of time already. We still have goals and dreams in regards to our fitness–but life has a flavor of craziness right now. This is where Focus T25 can come in & change your life! This program was designed by Shawn T (creator of Insanity, Hip Hop Abs–yeah, ya know him!) to take your workout into “let’s get this done, I man business and I don’t have an extra second to waste” mode! Join me, starting on August 5th to begin & complete the Focus T25 program! We will daily keep each other going & push each other to really work for our goals that we share. We will be posting our workouts, our meals, there will be weigh-ins, and tons of motivation & support over on Facebook. The commitment is to follow the complete program, meals & workouts–which are 25 minutes each and 5 days a week (COME ON! You CAN do that!). So, are you in? Are you ready? If you want to join us please comment on this post here or Like/comment on Facebook & share it on your wall so that the word gets out to people who might want to join us!